If you are anything like me you daydream about the wonderful handmade or DIY gifts you will give to people. Next thing you know it’s the 15th of December and you’ve got no time to get everything ready for the teachers at school and church and the leader of your women’s group that meets in 3 days…. So we are going to get it done this year! Over the next 4 months we are going to break it down into manageable chunks that will keep us on track. For the past several years I’ve not gotten many Christmas cards out. I want to change that this year, so I need this as much as anyone else. I always have the great ideas that just never see the twinkle of the tree lights. Not this year! We are taking it from PINTEREST TO THE PRESENT – wrapped, tagged and given with love and care. Where do we start and why are we starting so early? Here, and so we GET IT DONE!! Go through your Pinterest boards, craft magazines, cookbooks – wherever you have those ideas that you think you might want to do and pick out what you can reasonably do. Pick out 3, 4, 5, or even 6 that are really good contenders. You can narrow it down later. Now start making your list of all the people that will get these treasures or goodies from you. You may add to or subtract from this list over time, but you need to have an idea of the scope of your projects. Get yourself a box or bag to start assembling all of the items you’ll be using along with your lists and instructions. While you are at it, you might as well start thinking about those little Halloween treat baggies and Thanksgiving place cards and napkin rings that you’ve been eyeing on Pinterest and are just dying to make. 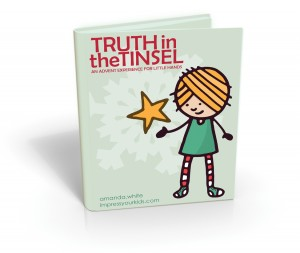 Did you work through Truth in the Tinsel, by Oh Amanda last year? I tried, but waited too late to start collecting the materials and it just all fell apart about a week in. This is one of my goals this year - Do It All. You can get the e-book here to start working through Advent activities with you child. Do these two things and let me know in the comments what great ideas you are coming up with. I want to be able to help you with the next steps. Grab a button from over there on the right while you’re at it to remind yourself and share with others if you like. I’m getting in the holiday spirit just thinking about it. September 25 we'll move on to the next phase. You can read about the Plan It phase of Handmade Holidays by clicking on this link. I'm checking your boards out for inspiration but not quite the same way you mean. My sisters and I are raising money for the American Cancer Society. Kind of a giving back for all they did for me and my parents during their battles with cancers. We were just talking this morning of the Holidays being a good time to create and sell to raise the funds. So I'm searching over your boards with that in mind. Although the baking things...I would do those just cause they are pretty. That's an excellent idea! There are some great knitting projects for hats and patterns for comfort dolls. So many things to do. I'd love to hear what you end up doing. Oh, and I do love pretty baked things. Wish I had the skills to recreate them all. I'm jumping out of my skin here...did you know I love ALL THINGS CHRISTMAS??? So excited to follow you. I still haven't even checked out Pinterest but I just might have to for the sake of this project! Yay! You will love Pinterest. It makes holiday stores look like just a last ditch effort. So glad you will be joining us. This will be great fun for you, I hope! On that note, do you have a cute little button at the end of your post? for some reason I get a blank little square, so I can't see what it says! :( ... maybe it's cause I'm on mac? Michael's bettser step off! Haha! I hope you were able to get the button. I'm so glad you stopped by to visit me from Lisa-Jo's. It seems like the universe intended for us to "join" together! Your blog is wonderful. I really enjoyed your post about finding your passion. It seems that we're kindred spirit. 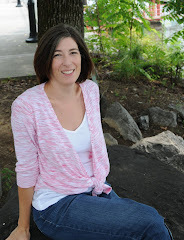 My blog too is an outlet for my passion and my desire to learn and share with others. I think your Pinterest to Present Project is a terrific idea. I'm not sure I'm ready to join today, but I am inspired by it and will be following along. Thank you! Come back any time. Lisa-Jo has a way of doing that with people! BTW - purple and green is my favorite color combination, and that is the granny square you currently have showing. I'm also developing a very dangerous yarn addiction. what an awesome idea! I'm working on an advent project, so I'm definitely in the mood, and you're right...it takes time to get it done well and without the last minute stress! Especially if you haveto collect crafty things like lids. Can't wait to see what you are doing. Please show us when I get the link set up. I always have the best intentions to go though things like that with my kids, like the bookclub I started with my daughter on Little House on the Prairie, halfway through I realized we need corn husks and molasses and a bunch of other things to do the activities. It's a great idea to look ahead (in my case, way ahead) to make sure you're not overwhelmed when it's time to actually sit down and enjoy each other. Totally happened to me last year with the Truth in the Tinsel book. I want to have it all ready to go this year.